Located only a few minutes from the heart of capital Kingstown, the cruise terminal has deepwater berths for two vessels. If more than two ships in port , you will be tendered. The facility has about 20 shops that sell duty-free items and handicrafts. There’s a communications center, post office, tourist information desk, restaurant and small food court. 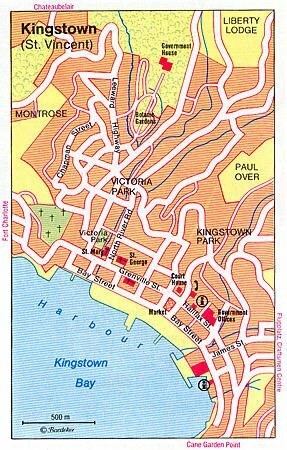 On the south west coast of the island is Kingstown the small bustling capital, built on a broad bay between two hilly promontories. From Kingstown, highways wind their way northward along both coasts: the Atlantic or Windward coast is rugged, with pounding surf and rocky shores, providing dramatic landscapes; the Caribbean or Leeward coast offers spectacular scenery and most of the island's beaches. The most beautiful beaches in St. Vincent lie along the south coast, some of the best being at Villa, four miles from Kingstown. Right outside of town is the old Fort Charlotte, which sits on a hill overlooking St. Vincent Bay. and is well worth exploring. The government sets the rates for fares, but taxis are unmetered and you should always check the fare before setting off. About $30 per hour. Go to Bequia is by local ferry boat departing from near the cruise pier. An one hour trip. About $25 one way. St Vincent cruise excursions are all about the amazing eco-tourism opportunities, including diving and snorkeling, hikes to the 4,000-foot active volcano, Mt. Soufriere, and boating throughout the island chain. The Botanical Gardens are one of the most important and popular sites in St Vincent. They are the oldest botanical gardens in the Western Hemisphere (established in 1765) and are also an important conservation site (particularly for the St Vincent parrot). The Botanical Gardens are a short journey from the town center of Kingstown. The island's most popular strip is narrow Villa Beach, only a 10-minute drive from Kingstown. Its tranquil waters make swimming safe, and there are numerous simple cafes and watersports stands. Shops in the cruise ship terminal offer souvenirs, local crafts, duty-free goods, and other odds and ends. The bustling streets and markets of downtown Kingstown are within easy walking distance of the cruise terminal. The currency of St. Vincent and the Grenadines is the Eastern Caribbean dollar (EC$). While hours of business vary from store to store, they generally open from 8 am until noon, and 1 pm to 4 pm on weekdays and half day on Saturdays.